Analysis: The move is merely a formality after Kupp sustained a torn ACL during the Week 10 win over the Seahawks that required season-ending surgery. 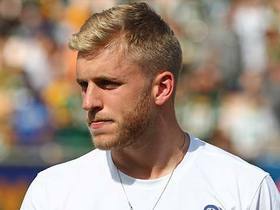 Kupp's procedure went according to plan, so the Rams will hold out hope that he'll make a full recovery and have a shot at returning shortly before the 2019 season gets underway. 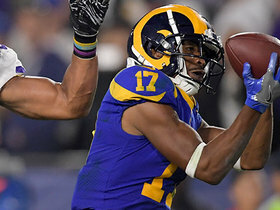 In a corresponding transaction, the Rams activated Pharoh Cooper (ankle) from IR to bolster their return game and provide an additional healthy body at receiver. Analysis: Kupp went down in the fourth quarter with a non-contact injury that saw him clutching his left knee. Of course, Kupp only returned last Sunday from a two-game absence due to a sprained MCL in that same knee. Given that connection, Rams coach Sean McVay didn't surprise many people when he said after the game that Kupp's outlook appeared grim, and now the wideout's season could be in jeopardy. The results on Monday's MRI should determine Kupp's fate, but the signs so far don't look good. Rams coach Sean McVay said, "I don't think it's very good" when asked about Kupp's knee injury suffered in Sunday's game against the Seahawks, J.B. Long of ESPN Los Angeles reports. Analysis: Kupp was forced out during the fourth quarter of Sunday's contest with what appeared to be a non-contact injury. As Kupp was down on the field, he was seen holding his left knee, which recently kept him out for two games while nursing a sprained MCL. While his situation will be updated as more news becomes available, the early indications surrounding his status are not positive. Kupp is doubtful to return to Sunday's game against the Seahawks due to a knee injury, Myles Simmons of the Rams' official site reports. Analysis: Kupp went down in a heap in the fourth quarter with what Simmons believed to be a non-contact injury. Rich Hammond of the Los Angeles Daily News reported Kupp was clutching at his left knee, which he initially hurt last month and rested with a pair of absences. Shortly after walking to the locker room, the Rams made the "doubtful to return" announcement, an ominous sign for the coming days. Kupp will be examined to determine the extent of the issue. Kupp (knee) caught five of six targets for 89 yards and a touchdown during Sunday's 45-35 loss to the Saints. Analysis: Kupp returned from a two-game absence due to a knee injury and made his presence felt. He finished second on the team in catches and receiving yards, doing most of his damage on a 41-yard touchdown reception to tie the game in the fourth quarter. Kupp's presence was surely missed while he was out, as he now has 527 yards and six touchdowns through six full games this season. He appears to be fully over the injury and should be in line to produce next Sunday against the Seahawks. Kupp (knee) doesn't carry an injury designation into Sunday's game at New Orleans, Josh Katzenstein of The New Orleans Times-Picayune reports. Analysis: Kupp followed limited practices Wednesday and Thursday with a full session Friday, erasing any doubt about his ability to return from a two-game absence. He'll re-enter the lineup with a favorable matchup against slot cornerback P.J. Williams, who was utterly overmatched against Minnesota's Adam Thielen last week. The Saints defense has given up 10.4 yards per target on passes to wide receivers, yielding 13 touchdowns and 1,650 yards in seven games this season. Coach Sean McVay reiterated Friday that Kupp (knee) will return to game action Sunday in New Orleans, Rich Hammond of the Los Angeles Daily News reports. Analysis: Kupp got an endorsement from McVay earlier in the week and then managed limited practice participation Wednesday and Thursday. Another update on Kupp will come later Friday when the Rams release their final injury report. Kupp (knee) remained limited at practice Thursday. Analysis: Coach Sean McVay hasn't wavered from his assertion that Kupp will return from a two-game absence for Sunday's showdown at New Orleans. "I know he's feeling good and confident and excited to be back out there," McVay told Myles Simmons of the Rams' official site. So far, individual drills have been the extent of Kupp's activity, per Lindsey Thiry of ESPN.com. Having said that, Kupp likely doesn't need many reps to be able to reincorporate himself into the Rams' dynamic offense. Kupp (knee) was limited at Wednesday's walk-through practice, Rich Hammond of the Los Angeles Daily News reports. Analysis: Coach Sean McVay declared earlier in the week that Kupp is expected to return for Sunday's game at New Orleans, per Gary Klein of the Los Angeles Times. Earning a limited tag, even if it occurred at a walk-through, is a positive step as Kupp aims to get past a sprained MCL in his left knee. His workload the next two days will go a long way toward determining his Week 9 availability. If Kupp returns, he likely will push Josh Reynolds out of the starting ranks and into a lighter-usage depth role. According to head coach Sean McVay, Kupp (knee) is expected to play Week 9 against the Saints, Gary Klein of the Los Angeles Times reports. Analysis: Kupp suffered a sprain MCL in Week 6 against the Broncos and has missed the Rams' last two games. The second-year receiver is a key cog in the Rams' explosive pass offense and should return to a productive role should he indeed play against the Saints. Keep an eye on Kupp's practice status throughout the week, but should he suit up, Josh Reynolds likely will head back to a depth role after catching two touchdowns against the Packers in Week 8. Kupp (knee) is inactive for Sunday's game against the Packers, Myles Simmons of the Rams' official site reports. Analysis: Kupp will be sidelined for a second straight contest while he recovers from an MCL sprain, which kept him from practicing throughout the week. The Rams haven't closed the door on Kupp playing Week 9 against the Seahawks, but the wideout will probably need to demonstrate progress on some level when Los Angeles resumes practicing next Wednesday. On an encouraging note, Kupp was able to go through a pregame workout Sunday, though the extent of his activity wasn't known, according to Simmons. Kupp (knee) is listed as doubtful for Sunday's game against Green Bay, Lindsey Thiry of ESPN.com reports. Analysis: Kupp was spotted doing some work on a side field Thursday, but he still hasn't returned to practice and doesn't seem to have any shot at avoiding a second straight absence. Josh Reynolds will take over in three-wide formations, with Robert Woods likely spending much of his afternoon working from the slot. The Rams will hope to get Kupp back for Week 9 against the Saints or Week 10 against the Seahawks. Kupp (knee) worked out on a side field at Thursday's practice, Vincent Bonsignore of The Athletic reports. Coach Sean McVay said Kupp (knee) is doubtful to play Sunday against the Packers, Lindsey Thiry of ESPN.com reports. Coach Sean McVay said Kupp (knee) won't play Sunday against the 49ers, Myles Simmons of the Rams' official site reports. Analysis: McVay hinted at a possible absence for Kupp earlier in the week and provided more definitive word Wednesday. 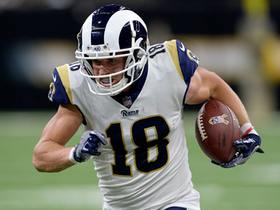 With Kupp sidelined for at least one game, Josh Reynolds will join Brandin Cooks and Robert Woods in the three-wideout formations that comprise the vast majority of the Los Angeles offense. Given that he's recovering from an MCL sprain, Kupp is in danger of missing time beyond Week 7. Coach Sean McVay said Kupp (knee) is "week-to-week" and "mostly likely" won't play Sunday at San Francisco, Lindsey Thiry of ESPN.com reports. Analysis: Kupp received an official diagnosis of a sprained MCL on Monday, one day removed from taking on a horse-collar tackle during Sunday's 23-20 win in Denver. McVay more or less confirmed a report from Adam Schefter of ESPN earlier Monday that Kupp "could miss some time." If he's indeed unavailable Sunday, Kupp likely would yield reps to fellow second-year wideout Josh Reynolds. Kupp sustained a sprained MCL during Sunday's 23-20 win at Denver, Adam Schefter of ESPN reports. Kupp said after Sunday's 23-20 victory in Denver that he's unsure of the severity of his left knee injury but will undergo additional testing, Lindsey Thiry of ESPN.com reports. Coach Sean McVay said Kupp only played briefly during the second half of Sunday's 23-20 win at Denver, Cameron DaSilva of USA Today reports. "It seemed like initially, things came out good," McVay said. "He played that first drive and did some things. He just wasn't himself." Kupp (knee) returned to Sunday's game against the Broncos, Myles Simmons of the Rams' official site reports. Analysis: Replay of Kupp's injury hinted at something that might sideline him beyond Week 6, but he's back on the field at the start of the second half Sunday after having previously been carted off. Kupp injured his left knee Sunday against the Broncos, Myles Simmons of the Rams' official site reports. Analysis: With Kupp carted off Sunday after his leg buckled under him, his Week 7 status (at minimum) is in peril. 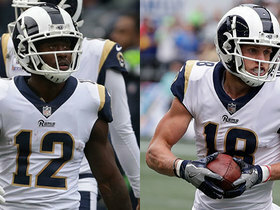 Brandin Cooks and Robert Woods are on hand to head the Rams' wideout corps in Kupp's absence, with Josh Reynolds a candidate to see added opportunities in the team's offense. Kupp (concussion) is active for Sunday's game in Denver, Myles Simmons of the Rams' official site reports. Analysis: This was merely a formality after Kupp cleared the concussion protocol Saturday. Working with Brandin Cooks (concussion) and Robert Woods, the trio will seek to stave off temperatures in the low-20s F and snow against a Broncos defense that has given up 12.6 yards per reception and six touchdowns to wideouts this season. Kupp officially cleared concussion protocol Saturday and is ready for the Rams' Week 6 matchup with the Broncos. Analysis: Kupp was considered likely to clear concussion protocol ahead of Sunday's game after logging a full session at Friday's practice, so this news does not come as a surprise. Barring any setbacks, he is set to take on a full workload against the Broncos' mid-tier pass defense. We'll at least note snow is in the forecast for Denver on Sunday. Kupp is expected to clear the concussion protocol in advance of Sunday's game at Denver, Rich Hammond of The Orange County Register reports. Analysis: Kupp's practice reps this week were directly correlated with his standing in the concussion protocol. After a full session Friday, he's on the brink of getting clearance to play. The only thing standing in his way is an appointment with an independent neurologist Saturday. As long as he's sans symptoms Sunday, he'll be available to Jared Goff against the Broncos' mid-tier pass defense (256.2 yards given up per game). Kupp (concussion) practiced fully Friday and doesn't have a designation for Sunday's contest in Denver, Cameron DaSilva of USA Today reports. Kupp (concussion) was limited in practice Thursday, Rich Hammond of the Los Angeles Daily News reports. Coach Sean McVay said that Kupp (concussion) would participate in individual drills during Thursday's practice, Myles Simmons of the Rams' official site reports. Kupp (concussion) didn't participate in practice Wednesday, Rich Hammond of the Los Angeles Daily News reports. Analysis: Coach Sean McVay said earlier Wednesday that Kupp and Brandin Cooks (concussion) took part in a walkthrough, which equates to a limited designation for most squads. Not so for the Rams. No matter, McVay told Hammond that he "feels good" about both receivers' potential to play Sunday at Denver. An actual appearance at practice Thursday would put Kupp and Cooks on the road to active status in Week 6. Coach Sean McVay said Kupp (concussion) took part in Wednesday's walkthrough and "feels good" about the wide receiver suiting up Sunday in Denver, Rich Hammond of the Los Angeles Daily News reports. Analysis: Considering McVay's comments, Kupp seems as if he'll be listed as limited on Wednesday's injury report, but both he and Brandin Cooks are still in the concussion protocol. If even one of the pair doesn't gain clearance from an independent neurologist prior to Sunday's contest, Josh Reynolds would be in line for a significant uptick in offensive snaps in three-receiver sets. Coach Sean McVay is optimistic about Kupp's chances of getting through the concussion protocol in time for Sunday's game at Denver, J.B. Long of ESPN Los Angeles reports. Analysis: Both Kupp and Brandin Cooks were diagnosed with concussions during Sunday's win at Seattle. Such injuries have to be taken case by case, so McVay's comments need to be taken with a grain of salt. An appearance at practice Wednesday or Thursday would boost the prospects of either wideout, but until the Rams are required to turn in a Week 6 injury report, it'll be difficult to forecast whether or not Kupp has a chance to play this coming Sunday. Kupp is out for the rest of Sunday's contest against the Seahawks with a concussion. Analysis: Kupp was having a nice day before leaving the game, compiling six catches (on nine targets) for 90 yards and a six-yard touchdown in the second quarter. 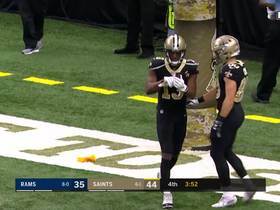 Brandin Cooks also left the contest concussed, so a heavy share of the passing game will likely fall on the shoulders of Robert Woods and second-year wideout Josh Reynolds. Kupp will need to clear the league's protocol before returning to action and will be hoping to do so before Week 6's road matchup with the Broncos. Kupp is under evaluation for a concussion potentially suffered Sunday at Seattle. 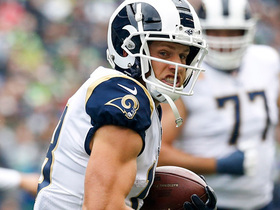 Analysis: Kupp is the second Rams wide receiver to undergo tests for a head injury, joining Brandin Cooks in the locker room. If he's unable to return, Kupp will end the game with six receptions (on nine targets) for 90 yards and one touchdown. Robert Woods, Josh Reynolds and KhaDarel Hodge are the only healthy LA wideouts at the moment. Kupp brought in nine of 11 targets for 162 yards and two touchdowns in the Rams' 38-31 win over the Vikings on Thursday night. He also returned one punt for four yards. Kupp will fill in for the injured JoJo Natson (hand) as the team's punt returner Thursday against the Vikings, Myles Simmons of the Rams' official site reports. Kupp caught four of six targets for 71 yards and a touchdown in Sunday's 35-23 win over the Chargers. Analysis: Kupp might be the third option in the passing game behind Brandin Cooks and Robert Woods, but he remains one of Jared Goff's most trusted targets, especially in the red zone (six looks inside the 20 prior to Sunday). In Week 4, Kupp will face the Vikings on Thursday Night Football. Kupp caught each of his six targets for 63 yards in Sunday's 34-0 loss to the Cardinals. Kupp secured five of nine targets for 52 yards and a touchdown while adding 12 yards on two carries in Monday's season-opening, 33-13 win over Oakland. Kupp will not play in Saturday's preseason game against the Texans, Myles Simmons of the Rams' official site reports. Analysis: Kupp may have already played his last preseason action for the Rams with only one week remaining before the regular season fires up. He's slated to serve as the team's slot receiver once again in 2018, coming off a rookie campaign during which he racked up 62 grabs for 869 yards and five touchdowns on 94 targets. 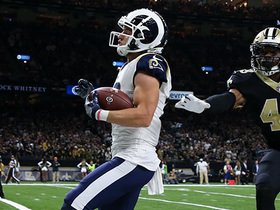 Kupp is part of a deep receiving corps that also includes Brandin Cooks, Robert Woods, Josh Reynolds, Pharoh Cooper and Mike Thomas, ESPN.com's Lindsey Thiry reports. Kupp caught eight of 13 targets for 69 yards and a touchdown during Saturday's 26-13 loss to Atlanta in the wild-card round. 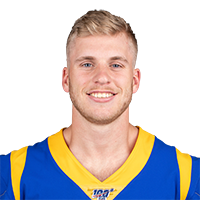 Kupp (knee) is listed as active Sunday versus the 49ers, Kristen Lago of the Rams' official site reports. Updating a previous report, Kupp (knee) is listed as questionable for Sunday's game against the 49ers. Kupp (knee) has been ruled out for Sunday's game against the 49ers, Rich Hammond of the Los Angeles Daily News reports. Analysis: Kupp might actually be healthy enough to play, but the Rams obviously aren't going to take the risk when they already plan to rest a number of key players. Josh Reynolds and Pharoh Cooper are primed for significant playing time alongside Sean Mannion on Sunday, while Kupp should be ready to return for the wild-card round of the playoffs. Head coach Sean McVay said Thursday that the Rams offense won't "see much" of Kupp (knee) against the 49ers on Sunday, Rich Hammond of the Los Angeles Daily News reports. Kupp missed Wednesday's practice with a sore knee, Lindsey Thiry of the Los Angeles Times reports. Kupp caught four of six targets for 65 yards and a touchdown in Sunday's 27-23 win over the Titans. Analysis: Kupp came alive on a fourth-quarter drive with his team trailing 23-20, drawing a 31-yard pass interference penalty, then getting his knee down in the end zone for a 14-yard, diving touchdown. The rookie slot receiver continues to be a major cog in Los Angeles' high-octane offense, even with all the other skill position players at full health. Kupp caught two of three passes for 21 yards during Sunday's 42-7 win. Kupp caught five of seven targets for 118 yards and a touchdown in Sunday's 43-35 loss to the Eagles. Kupp secured five of six targets for 68 yards during Sunday's 32-16 victory over the Cardinals. Kupp corralled eight of 11 passes for 116 yards in Sunday's 26-20 victory against the Saints. Kupp brought in six of seven targets for 64 yards in Sunday's 24-7 loss to the Vikings. He also lost a fumble. Kupp caught six of seven targets for 47 yards in Sunday's 33-7 win over the Texans. Analysis: Kupp notched a new career high for receptions while still landing between 35 and 60 yards for a sixth consecutive game. It's hard to see much upside so long as Robert Woods stays healthy, but the rookie is at least good for a couple of catches every week, and he gets more red-zone work than the typical slot receiver. Kupp draws a tougher matchup in Week 11 on the road against the Vikings. Kupp caught three of five targets for 54 yards during Sunday's 51-17 win over the Giants. Analysis: The rookie has carved out a sizeable role in the Los Angeles passing attack and offers a reliable fantasy floor with 26 receptions, 370 yards and three touchdowns through eight games. Unfortunately, quarterback Jared Goff continues to spread the ball around, and the focal point of the offense remains Todd Gurley. As a result, Kupp's upside is limited. While Kupp will probably have a few more strong showings, but it will be difficult to trust him week in, week out in the majority of settings. 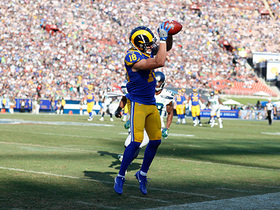 Los Angeles Rams wide receiver Cooper Kupp hauls in a spinning toe-tap sideline grab for a 25-yard gain. Los Angeles Rams quarterback Jared Goff times his pass perfectly as he delivers a 26-yard strike to wide receiver Cooper Kupp. Los Angeles Rams quarterback Jared Goff throws a pass to wide receiver Cooper Kupp on a crossing route and Kupp races into the end zone for a 41-yard touchdown. NFL Network Insider Ian Rapoport brings the latest on the recovery of Rams wide receiver Cooper Kupp. 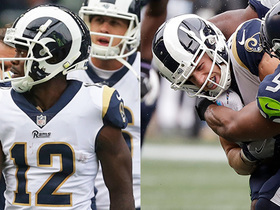 NFL Network Insider Ian Rapoport brings the latest on the recovery from concussions by Rams wide receivers Brandin Cooks and Cooper Kupp. NFL Network Insider Ian Rapoport brings the latest information on the concussions suffered by Rams wide receivers Cooper Kupp and Brandin Cooks. Los Angeles Rams quarterback Jared Goff tosses a quick pass to wide receiver Cooper Kupp for a 6-yard touchdown. 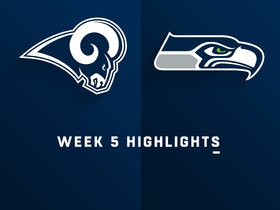 The Rams lit up the Vikings with seven plays going over 20 yards on Thursday Night Football. Is this the next coming of the "Greatest Show on Turf?"